Glenn Cunningham was born in Atlanta, Kansas on August 4, 1909. His father, Clint Cunningham, was a water-well driller who also did odd jobs. At the age of 7, Cunningham and his older brother Floyd were badly burned in a schoolhouse fire. The little country schoolhouse was heated by an old-fashioned, pot-bellied coal stove. Glenn Cunningham had the job of coming to school early each day so that he could use kerosene to start the fire and warm the room before his teacher and his classmates arrived. One cold morning someone had mistakenly filled the kerosene container he used with gasoline, and disaster struck. The students arrived to find the schoolhouse engulfed in flames. Terrified on realizing that Glenn was inside, they rushed in and managed to drag the unconscious little boy out of the flaming building. He had major burns over the lower half of his body and was taken to a nearby county hospital. From his bed, the dreadfully burned, semi-conscious little boy faintly heard the doctor talking to his mother. The doctor told his mother that her son would surely die as the terrible fire had devastated the lower half of his body. But the brave boy didn’t want to die. Glenn made up his mind that he would survive. And somehow, to the amazement of the physician, he did survive. Yet when the mortal danger was past, he again heard the doctor and his mother speaking quietly. The mother was told that since the fire had destroyed so much flesh in the lower part of his body, it would almost be better if he had died, since he was doomed to be a life time cripple with no use at all of his lower limbs. His mother refused to let the doctors amputate. The doctors told him and his parents that he would never walk normally again. However, Glenn and his family refused to accept such claims and with much determination and unwavering faith, he would not only walk, but run, and very fast. But although he did survive, the effects of the fire had clearly taken their toll: the arches on both of his feet were damaged, the toes on his left foot were nearly burned off, and his right leg was a few inches shorter than his left one. Doctor wondered if he would ever walk again, but a determined Glenn went home and began steadily rehabilitating his injuries. When he wasn’t in bed, he was confined to a wheelchair. One sunny day his mother wheeled him out into the yard to get some fresh air. This day, instead of sitting there, he threw himself from the chair. Glenn pulled himself across the grass, dragging his legs behind him. He worked his way to the white picket fence bordering their lot. With great effort, he raised himself up on the fence. Then, stake by stake, he began dragging himself along the fence, resolved that he would walk.He started to do this every day until he wore a smooth path all around the yard beside the fence. There was nothing he wanted more than to develop life in those legs. After weeks of practice, he gained a minor victory when he walked with crutches. Several months later, he was able to stand on his own. And nine months after that, he could once again walk without crutches. It was Glenn’s determination and persistence that led him to walk again.Slowly over a period of months, Glenn’s legs began to function, to the astonishment of the doctors.Christmas eve 1917, Glenn gave his mother a present by taking his first steps without holding onto anything. Soon, he proceeded to run, grabbing a milk cow or mule’s tail, taking as much weight off his legs and running behind as the animals headed to water. He still couldn’t straighten out his right leg. Every step was “like daggers,” but he never quit trying. In time Glenn discovered that it was less painful to run than to walk. Ultimately through his daily massages, Glenn’s iron persistence and his resolute determination, he did develop the ability first to stand up, then to walk haltingly with help, then to walk by himself – and then miraculously – to run. His legs remained deeply scarred, however. Throughout his life, he would have to massage them and spend time doing long warm-up exercises in order to maintain circulation. In addition, his injuries meant that he could never run smoothly or efficiently; he compensated with endurance and strength. Glenn said this about his first race “My father was definitely against athletic events. He just didn’t see the need for it. But I decided to enter a competition. I just didn’t tell anybody at home. I showed up at the track meet in my workclothes and thick-soled canvas sneakers. I was a fourth grader, and most of the others were high school athletes. All of them wore running shorts and spiked running shoes. I must have looked like David lined up against all the giants, but I won going away! I ended up getting a whipping from my father that evening when I got home.” Decades later, he would call that race the biggest of his life—a monumental statement considering the races to come in his future. By the time he reached high school, Glenn was a solid multi-sport athlete, competing in football, basketball, and track, despite the fact that he required long extensive warm-ups before any athletic activities due to the various circulation problems caused by his childhood accident. He competed in both the 1932 Summer Olympics as well as the 1936 Summer Olympics.In the 1932 Olympics he took 4th place in the 1500 m, and in the 1936 Berlin Olympics, he took silver in the 1500 meters.An athlete who survived severe burns on his legs as a youth, Glenn Cunningham was one of the world’s top middle distance runners during the 1930s, winning the prestigious Sullivan Award in 1933 as the nation’s top amateur athlete. 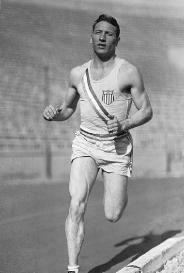 In 1934, he set the world record for the mile run at 4:06.8, which stood for three years. In 1936, he set the world record in the 800 m run. In 1938, he set a world record in the indoor mile run of 4:04.4. He retired from competition in 1940. In 1933, Cunningham graduated from the University with the highest academic record in his class.Cunningham went on to graduate school at the University of Kansas, then earned a master’s degree from the University of Iowa in 1936, and a Ph.D. in physical education from New York University in 1940. He taught physical education at Cornell University from 1940 to 1944, and later joined the Navy, where he attained the lieutenant rank, helped create physical training programs in several Navy stations, and visited many military hospitals in order to encourage wounded soldiers. Cunningham married Ruth Sheffield, in the summer of 1947. Although he might have used his name as a star athlete to make a great deal of money, he was more interested in helping others than in making a fortune. He and his wife opened the Glenn Cunningham Youth Ranch and over the next three decades, raised over 10,000 foster children. Glenn Cunningham went from possibly never walking normally again to holding world records at the Olympics for the USA. Those kinds of achievements would not happen without extreme will power and faith. • If you don’t stand for something, you will fall for anything. • Belief influences action, and action influences belief. • Act as if it were impossible to fail. • Every great accomplishment started with a thought. View this video to see Glenn Cunningham in action. This entry was posted in Uncategorized and tagged 1932 Summer Olympics, 1936 Summer Olympics, athelete, athlete, athletic events, Atlanta, Cornell University, Cunningham, fastest athelete, fastest running, Glenn, Glenn Cunningham, Glenn Cunningham + runner, Glenn Cunningham Youth Ranch, inspiring athelete, Kansas, mullti-sport athlete, New York University, olympic medals, Quotes of Glenn Cunningham, running, running shoes, Sullivan Award in 1933, University of Iowa, wheelchair. Bookmark the permalink.